The Mini E is fully electric car made by BMW and is based on the petrol Mini. The Mini E can travel around 240 kilometres on a single charge depending on driving style and conditions. It is powered by a 150kW electric motor, charged by a lithium-ion battery. The Mini E can accelerate from 0 to 100 km/h in 8.5 seconds and has a top speed of 152km/h. 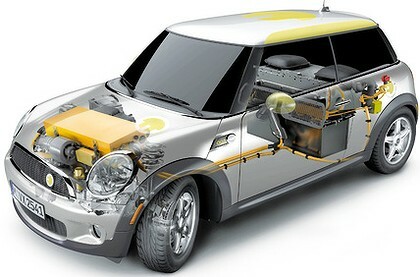 In October 2009, 600 Mini Es were undergoing trials in California, New York, the UK and Germany making it the largest trial of electric cars by any manufacturer in the world at that time. Attempts have been made to obtain a car for trials in Australia, but the demand for these cars has so far made this difficult. So the idea to bring the car to Australia is also to get some politicians behind the wheels so they can experience really one of the cars that is in larger scale use at the moment. While the BMW Group’s electric prototype is the Mini E, the production version may come in a BMW-badged body. The car is designed for urban use rather than long distance trips. Mini, however, sees a way around the pollution issue through “feed-in” tariffs, where the Government forces utilities to buy some of their electricity from renewable energy sources, despite their higher cost. If you look at Europe they have got feed-in tariffs to create renewable energy and that’s why we want to get the politicians to get behind the wheel of the car – not only to drive the car but to give them BMW Group’s perspective of what would need to happen to encourage green power. The car may be available in Australia 2Q10.